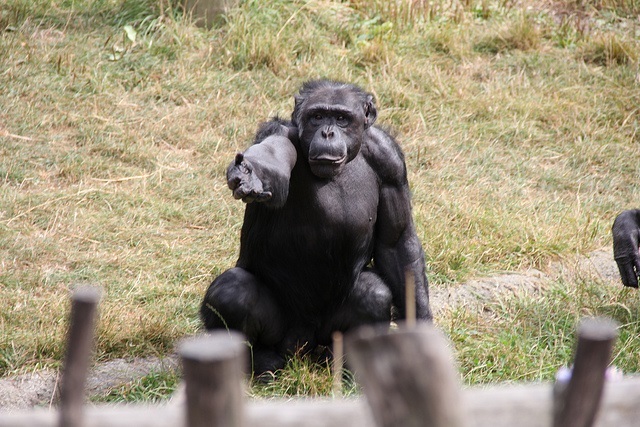 A chimpanzee alpha males has dominance over all other members of his group. He is the boss and has no mercy when it comes to preserving his position and status. I got your balls in my sack! He has his frame of mind and everyone else lives in his reality. A leader cannot let himself get walked all over by others. Assertiveness is the main way of functioning for an alpha. If he gets too passive, someone else will take his place. He understands the fact that not everyone in the world is nice and there are many individuals who put themselves first and won’t hesitate to put you down and stab you in the back when it serves their own purpose. Unscrupulous individuals take advantage of the niceness and other weaknesses of others and that’s why an alpha has his own interests at heart first. That is the reality of the jungle. There are times when merely being assertive is not enough, and at least a bit of ruthlessness is required. If a threat is in the way, you need to eliminate it without thinking of the feelings of others. You are the one who comes first and a little bit of heartlessness is part of the package. Ruthlessness takes many forms. One is being able to take hard decisions which might hurt the feelings of others. This is one of the many qualities that a leader needs to have. However there is another even more controversial form of ruthlessness. This is the manipulation of others to get what you want. Being manipulative is one of the strategies that some chimps, including alphas, use. Even if an alpha himself does not use these techniques himself, he needs to know about them in order to protect himself against them and be ruthless with the guys who use them against him. Primatologists have even coined the term “Machiavellian intelligence” when it comes to chimps. Chimps often behave as if they had learned “The Prince” by heart and are applying the principles described in the book. In the context that the primate researchers use the word “Machiavellian”, they mean that chimps are often very manipulative and like to scheme and plot. Their main objective is to get and keep power. Alliance strategy is frequently opportunistic and can be accompanied by the concealment of intentions. Chimps often ally with the chimps that will help them gain more benefits. However they can stab their former allies pretty quickly in the back and switch alliances. Very commonly they conceal their real intentions and can strike at any moment. Chimps are very opportunistic. Males who are ranked lower on the social hierarchy are always on the lookout for opportunities to improve their ranking and reach alpha status. This opportunity may come when an alpha gets older or loses a key ally. Goblin was a very good Machiavellian strategist. As a young adult he put himself under the wings and protection of Figan, the alpha male at the time, becoming his protege. Goblin learned everything he could from Figan and served as one of his biggest allies. However one day, he sensed his opportunity and rose up against his former mentor and deposed him, taking over the position of the alpha male of the group. Chimps often use social manipulation in order to attain their goals. They are very good at concealing their true intentions and the best manipulators often win out. This effect is the strongest among those who are the best at reading social situations. The “Game of Thrones” seems to get played out pretty often in the African jungles. Use of social manipulation to attain certain goals is a very complex game, which can change at any moment. Alliances are made and broken, rules are thrown out the window, misdirection is applied, with all this being interspersed by periods of fighting and forgiveness. That’s why the individual that has a superior ability to read social situations and their dynamics, and can then use the right strategy that will work in order to exploit that particular situation, oftentimes prevails. Chimps can understand the goals and intentions of others. They make judgments about the mental states of the chimps around them and then use these judgments to try to manipulate the way the others perceive the situation. Goblin was one such individual. He knew how to read social situations, he was manipulative and he was ruthless. Some of these characteristics can be seen when we go back to the episode when Mustard fell on his head. He immediately judged what Mustard did as unintentional and non-threatening and took it calmly without punishing him. However he realized that that exact situation might make him look weak, which could get exploited by others. That’s why he went after Freud, even though Freud had nothing to do with the situation except having watched it as a spectator. By beating up on Freud, a potential rival, Goblin showed his ruthlessness and political savvy. At that exact moment, he needed to show everyone who is the boss and he did just that. However straight-up violence and aggressiveness is only a part of ruthlessness. It is only one tactic to be applied only in certain contexts. The smartest alphas use it sparingly, only when absolutely necessary, because it carries with it very high costs in terms of energy expenditure and also high risk of injury. It can also sometimes backfire on them and provoke insurrections. That’s why the smartest alphas use it only at certain occassions and not systematically. Alpha chimps don’t follow just one tactic to gain power. Machiavellian intelligence also implies the ability to change tactics during the course of the game, as the situation changes and evolves. 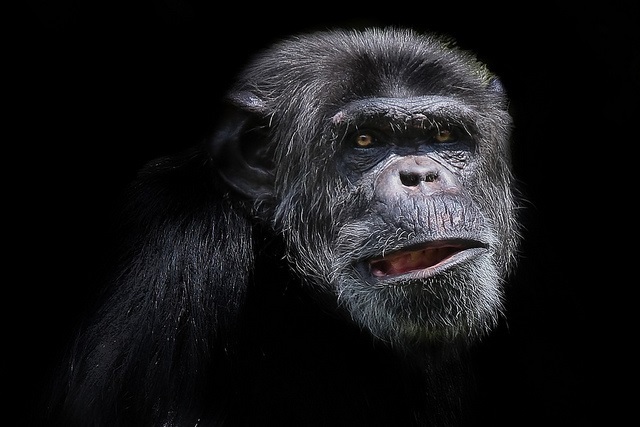 Chimp behavior might not always be Machiavellian. It changes based on circumstances. There are periods that alternate between competition and cooperation, aggression and reconciliation, non-aggressive strategies and aggressive strategies. This is the reality of being part of a complex system. The ability to read social situations and then determining which situation requires ruthlessness is the key to coming up with the correct action at the correct time. That is why it is important to have different types of models in your head to fall back on. Chimps spend their entire lives living in a very dynamic social context and start developing models in their heads from early on. The ones who figure out how things work, can switch between different contexts and apply different strategies when required, have the mental tools to rise up in the social hierarchy. Being ruthless in this type of context is a necessity, not a luxury. If someone does not want to stay at the edge of mediocrity, they need to detach themselves a bit and work on their killer instinct. Chimps use social intelligence for selfish motives and being at least a bit selfish is a prerequisite for ruthlessness and hence power. Some alpha male chimps are quite ruthless. They stomp on everything that gets in their way. This might not always be the best strategy though, as sometimes they take it a bit overboard. Frodo is one example of an alpha male that took care of everyone who got in his way. Jane Goodall described him as ruling his community (Kasakela at Gombe) with an iron fist and as being a bully. He was known to be quite aggressive and beat up anyone who happened to be in his path, including humans. Frodo was a guy who did not give a f#%k. He was a despot who overthrew his own brother Freud from the alpha spot and rarely groomed anyone. In fact he would often force everyone else to groom him. All this was helped by the fact that he was the biggest individual in his community and so could manhandle any opposition. He would always try to show people who the real boss around there was. Imoso is another example of a ruthless alpha. He was the alpha male at Kanyawara in the Kibale Forest in Uganda. Together with his ally Johny, they overthrew the incumbent alpha, Big Brown and his chief ally Tofu. Imoso was always the most aggressive member of the community, with the largest number of displays by far and would always challenge anyone who questioned his authority. This corresponds quite well to scientific studies which show that dominance rank in chimpanzee communities in positively correlated with aggression. Yeroen, a chimp at the Arnhem Zoo in the Netherlands, can serve as the prime example of a ruthless Machiavellian chimp, who would manipulate in whatever position he was. 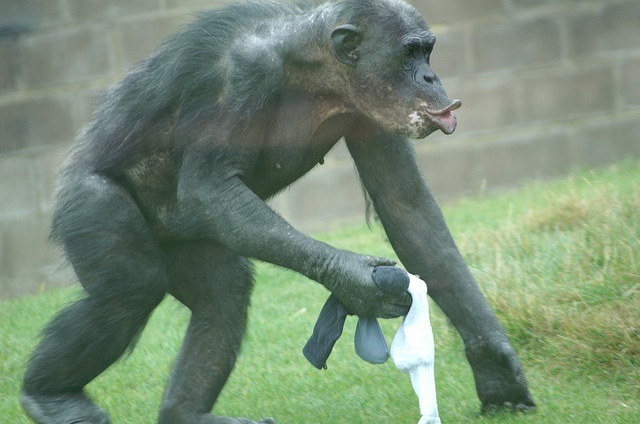 He served as the alpha for periods, but at times also helped another chimp Nikkie become the alpha. However he would then be the power behind the throne, pulling strings and manipulating whenever he wanted. Yeroen had quite a few Machiavellian traits. He was calculating by nature, always putting himself first and keeping watch on his interests at all times. He would also have the pursuit of his own goals as the priority and wouldn’t consider others, often cheating to get his own way. His strategy was quite successful. Coming back to Gombe, we have an example of another type of ruthlessness from an alpha. Figan was known as a benevolent leader within his own community, however he became quite ruthless towards a group that splintered off, becoming outsiders. He proceeded to wage, what became known as the Gombe Chimpanzee Civil War, which resulted in his group eliminating the other group by killing all the males. He judged the other group a threat and the fact that conquering their territory would also help expand his group’s feeding grounds and better their chances at survive, he proceeded onto leading a ruthless campaign of extermination. 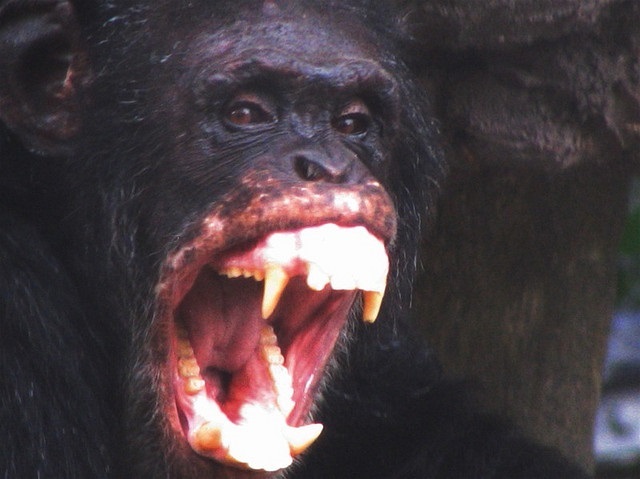 Some chimp leaders even exhibit the traits of psychopaths, often displaying the three tendencies of the Triarchic Model of Psychopathy – boldness, meanness, and disinhibition. An alpha needs to be feared, but not hated. Chimpanzee politics often resembles the “House of Cards” series, sometimes not even stopping at murder. Some alphas are ruthless enough to murder their rivals. However too much aggressiveness can result in a backlash. If a healthy amount of fear turns into hatred, then that can spell the beginning of the end for the alpha. An alpha who is too ruthless can get himself killed. In that way, murder can become a reaction against ruthlessness. If too ruthless, an alpha can provoke a coalition to form against him and they will kill him. This is what happened to Pimu, the alpha male, who got deposed and killed by a coalition of lower ranking males after he was beating up on the beta male. This means that a certain amount of care needs to be taken when engaging in manipulative behavior and a balance should be kept between different strategies. Ruthlessness and Machiavellian Intelligence can take a number of forms, and is only one of the strategies that an alpha can take in a given situation depending on the circumstances. Machiavellian Intelligence implies that you know when to use which behavior, when to make an alliance and when to break it, or when to lie and when to tell the truth. It is about the use of social manipulation in order to attain certain goals. This means, a successful alpha needs to be able to combine the ability to read social situations, with using any strategy that works in order to exploit that particular situations. This means being able to use tactical deception when it should be used. Chimps make judgments about the mental states of other chimps. They can then use this ability in order to manipulate the others, for example deceiving them and clouding their perception of that particular situation. Machiavellian Intelligence is basically about the ability to change tactics as the social game changes and evolves, doing what works. This type of ability is necessary in order to survive and rise in rank. The unfortunate reality of the world is that others use manipulation and deception in order to further their own selfish motives and as an individual you need to be aware of that. You need to be ruthless in order to prevent others from walking all over you. Ruthless individuals often exploit the niceness of others and if you are nice by nature, you need to get a certain degree of ruthlessness and Machiavellian Intelligence in order to compete in a ruthless world. Even your best friends can often turn on you. For example Figan should have been aware of the ruthless nature of Goblin. Figan taught Goblin everything he knew and relied on him to be his ally, only for Goblin to turn around at one moment and depose him. Being ruthless at certain points is also beneficial for the group. Sometimes some individuals might not be pulling their weight or might be disrupting the good functioning of their community. The threat of coercion can keep trouble-makers, cheaters and slackers in line. For example, one day at the Arnhem Zoo, two young chimps came late into the cage, which meant they delayed the feeding time for the rest of the group. That night they ate, however the next morning they got beaten up by the more senior members of the group. Next evening, they were the first to arrive in the cage. They were taught a lesson. If the senior males had not been ruthless with them and instead let their behavior slide, they would have worsened the situation for the rest of the group. A leader needs to be ruthless for the sake of the greater good of his own group. A leader who is too nice and not ruthless enough, might have his group descend into chaos. What we cannot forget is that while fear can be effective for a while, it can provoke a backlash. That’s why it should be used only at certain moments and not systematically. Aggressive leaders usually end up losing respect and support from their subordinates and thereby their power. The most successful alphas are often the ones that are also generous. Constructive leaders are the ones who retain their rank for a long time. An alpha functions in a community of many individuals and an atmosphere of fear can quickly bring about a revolution. The best leaders are the ones who show a certain degree of empathy towards others and don’t abuse their position, but instead use it as a way to make others better off. They know that if the other individuals in the group are relatively happy, they are less likely to challenge the status quo. That means the reigning alpha can feel relatively secure in his position. An alpha has a role to play in his community and a happy, stable community is to his ultimate advantage. Alphas put much time and effort into helping others in their community. One remarkable story is that of Freddy, the alpha male of a group in the Tai Forest. As a generous leader, he was very secure in his position. His community included several females with their little kids. One unfortunate day, the mother of a small chimp named Oscar died. Oscar became an orphan, which at his age means almost a certain death. However Freddy, showed much empathy with the plight of the little chimp and basically adopted him, feeding, caring, and protecting him, ensuring his survival. This was a great demonstration of generosity. The most successful alphas know that a purely selfish, self-interested outlook on life is not in their best interest. They know that they depend on others as well, and so need to sacrifice a little bit of their own well-being to ensure that the others around them are also well off. A generous leader not only makes his community better off, but also creates trust. This can be very beneficial when a challenger arises. It has often happened that the rest of the community in such a situation would line themselves up behind the alpha and beat off the challenger, especially one they didn’t trust. Scientific studies show that chimps choose who they want to work with and often prefer chimps that are fair and they can trust. Studies also reveal that they like to be treated fairly and can sense unfairness and react accordingly. Chimpanzees know that their chances of survival are higher within a group and so when other members of the group are taken care of, they are better off as well. Altruism probably developed out of this. In this way, the chimps have a sense of empathy towards other members of their group and often help them out when in need. These types of acts then help promote cooperation, which is useful in such things as hunting or protection. Alphas understand the powerful effect that generosity has and use it to their own advantage. Some alphas are generous by nature, while others are generous only selectively when the situation requires it. For example, Figan was a very constructive and generous leader. He was dominant over his community and used his power to ensure social harmony. He did all this without needing to be aggressive. He made sure that everyone in his community was taken care off and there were no disputes between individuals, which earned him trust and respect from below. One thing that alphas are generous with is food. Food distribution can enhance his reputation and popularity and so it serves as an instrument of power. However, you cannot be too generous, as often nice guys are taken advantage of by the more ruthless individuals. So you still need to be a bit selfish overall. Alphas are often selectively generous and so use this as a way to enhance their own interests. Some alphas don’t share meat with their beta male competitors, and instead share it with their allies, females they want to get with, and other males who are not threatening to their position and can be potential allies. Ntologi was one alpha male who used this tactic in an excellent way. Individuals vying for power often become more generous in times when they are looking for support. For example, during a power struggle at the Arnhem Zoo in the Netherlands, one of the chimps vying for alpha status named Luit, adopted the “Santa Claus make-it rain” strategy. He started climbing trees and throwing down goodies from them to the entire chimp community, including his rivals. Earning the respect of others is a good way of having influence over them. Not everyone in the community is a scheming Machiavellian character. You need to watch out for those who are, but cannot be too ruthless. Being generous can earn you valuable allies. However you cannot be too generous either. You need to create a balance. What fascinating series of articles. I can’t wait to read the 3rd part. I’m very interested in reading your conclusions in how we can best use this knowledge. My biggest problem in my social life is that I can never quite feel comfortable in a group. I’m not sure why that is, If the group I’m trying to interact with or join has a particularly strong alpha male, I find my lack of influence within the group infuriating. So my strategy was to seek out groups with weaker males and dominate them, but the problem is that such groups often have few if any females within them, due to the weakness of the males. Which means yes, I’m dominating a group and getting a few females in the bargain, but nothing compared to what truly powerful alpha males I know get. Eventually I become bored with said group, and disengage from them entirely and spend large amounts of time on the edges of groups, never quite joining or fitting in. But when it comes to my job, as a manager, I have absolutely NO problems dominating my coworkers, even my bosses. For some reason, in the professional environment, I’m able to instinctually lead a team to success. It’s mind bogglingly frustrating. The third part should come out sometime this month and then I will also come out with a fourth part where I will try to come up with some ways that this knowledge can be applied in the real world. 2) Observe and learn from the current alpha of the group. The alphas always learn from the previous ones. For example in the Gombe group, Figan was the only chimp that as a kid was trying to copy what Mike the incumbent alpha was doing. He would go out and spend hours practicing rolling cans around. He was the only chimp doing that. He became the alpha just a few years after Mike. Then Goblin, the guy who took over the position from Figan, spent a lot of time as Figan’s protege, learning to do things the same way that Figan was doing them. Group dynamics are specific and what works for the current alpha will most likely work for others as well (keeping in mind pointer number 1).